Shares are available in an impressive four-year-old son of Midnight Legend. He is out of the talented Milan mare Buxom, who won her first two starts in bumpers and also ran very respectably in Listed company. 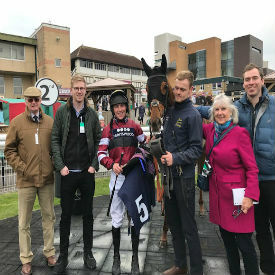 She went on to prove a useful and consistent performer for Jamie Snowden over hurdles, winning a two-mile handicap at Huntingdon. 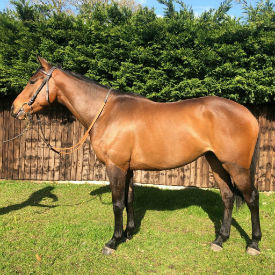 This exciting youngster has been backed and ridden away, and is shortly set to follow his mother into training with Jamie, whose Lambourn yard continues on an upward curve. Shareholders will be invited to come and watch the horse develop on the gallops and making use of the exquisite facilities in the famous Berkshire racing village. If his pedigree is any guide there is good reason to be excited as to this gelding's future prospects. Not only was the dam a talented bumper and hurdles winner, but she is a sibling of the 131-rated chaser and seven-time winner West Of The Edge, whilst the next generation of the family features the Grade-2 placed novice hurdlers Woodys Deep Ocean and Rev It Up - the first-named gaining that black-type behind none other than Kicking King. The extended family also includes the Grade-2 placed chaser Intac and the Listed-winning hurdlerSister Superior, whilst Milan is the broodmare sire of Grade-1 winning chaser Coney Island. The late Midnight Legend was a high-class dual-purpose performer during his racing days, and has gone on to carve out a tremendous legacy as a NH sire. His most famous offspring is of course the Gold Cup winner Sizing John, and this season has seen his Warriors Tale win the Grand Sefton over the National fences at Aintree, Midnight Shadow take the Grade-2 Relkeel Hurdle at Cheltenham and The Two Amigos continue his sequence of wins in the Sussex National. In short, he remains as relevant as ever almost three years after his death. With impressive physical scope and an appealing pedigree, this affordable opportunity to get involved with an exciting jumping prospect must not be missed. College Oak was a fine 2nd at Fontwell on his racecourse debut where he showed a lot of promise. He was very well behaved in the preliminaries, and cantered to post well. He was a bit keen over the first 200 yards but settled into a nice rhythm in a handy 4th for most of the race. He was green when the pace of the race lifted around the final turn for home, but stayed on strongly up the hill to gallop through the line well. He’ll improve enormously both mentally and physically for that run and shouldn’t be far away next time out. Gavin Sheehan reported that he was delighted with his run, and thought he would be able to win his bumper before developing into a nice novice hurdler. College Oak is a 4-year-old gelding by the cracking sire Norse Dancer (sire of the multiple Grade 1 and 2 winner, Yanworth). He is out of a winning sister to the three-time Cheltenham Gold Cup winner, Best Mate, and the Grade 1 winning hurdler Cornish Rebel, as well as the multiple winner Inca Trail, who I even won on! With a Gold Cup winner in his blood and being by the sire of a Christmas hurdle winner, you can see his pedigree has a wonderful blend of both stamina and speed. 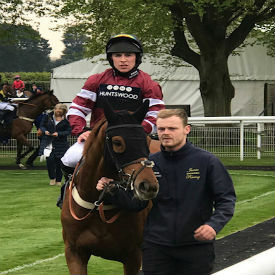 There are a few places left in the “Radleian Society Racing Syndicate” which is open to any Old Radleian’s, parents or anyone connected to Radley College.